On the First Day of Christmas my true love gave to me... a Penguin in a Pear Tree (maybe make that an Olive tree). We love Christmas books during the holidays. Several books feature these cute waddling penguins. 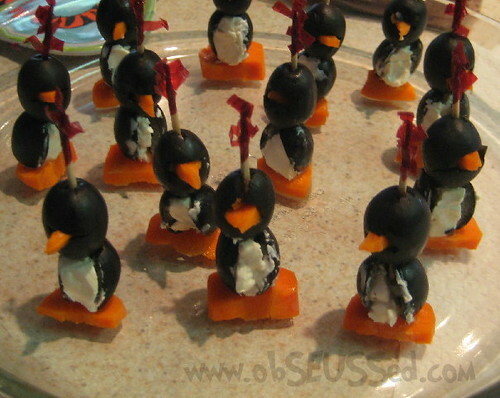 As you read books, have your kids try making this cute Penguin olive appetizers. Our kids had a blast making these. They realized you can do more with olives than just put them on every finger. They look a little sloppy because that's what happens when kids get in on the fun. The kids loved eating them too I just had to swat their hands away a few times while we were making them. 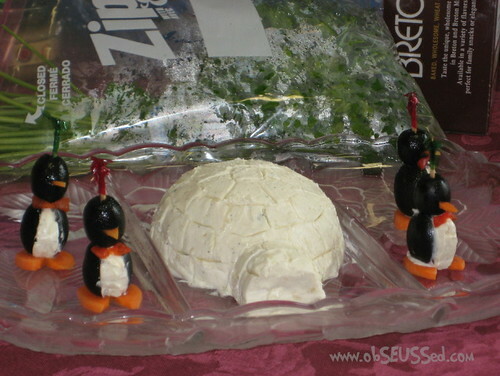 My neighbor introduced me to these darling penguins made out of olives, carrots and cream cheese. I'm not sure where she originally got the idea but I'm glad she shared it. Now see my neighbor's beautiful version. I love her cheese ball igloo made out of softened cream cheese, mixed with chives and garlic salt. She also cut pimentos for the bow ties. Don't forget the decorative toothpicks. Kids love making these. All Recipes.com has a great recipe to make these. If you want to see some perfect penguins go to Once Upon a Plate. Or see this tutorial at Paper Caper. Serious Eats uses a mozzarella ball instead of cream cheese. 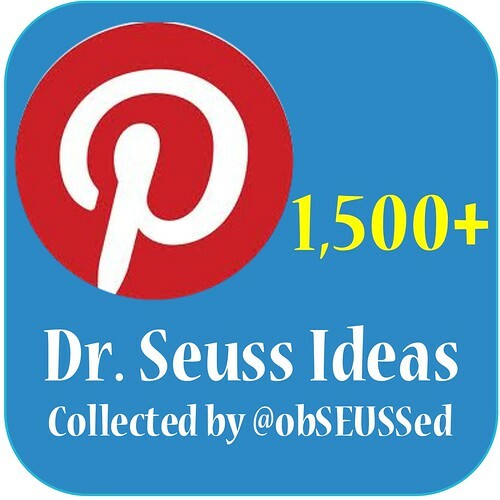 You might like Mr. Popper's Penguins. 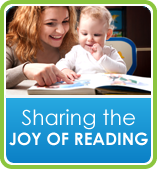 Try finding a penguin book at your library or online. 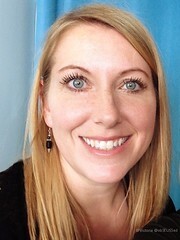 Linking to Today's Creative, Get Your Craft On Tues.
House of Hepworths Rock your Recipes. Little H had a penguin birthday this year and I made a few of these little guys for dinner. Though the boys thought they were cute, not one of them liked to eat the little suckers! I heard your kids really liked them...I guess you never know, right? !